Auto Care Experts Philadelphia | British Restoration Corp. Here at British Restoration Corporation, we have performed over 450 different restorations. Locally owned and operated in Philadelphia, PA, we have more than 30 years of experience in metal fabrication and mechanical restoration. 75% of our work comes from rescuing cars from other restorers. Our cars provide you with a sense of quality that you won’t find with most other restorers. With an array of prized models for sale and skilled technicians adept at every aspect of restoration, we are proud to be the preferred choice for British sports car enthusiast worldwide. Choosing a Restoration Shop is much like selecting a Doctor, or a Contractor. You must check reputation, references and ratings. Like a Doctor, restoring British Cars requires a special set of skills. We have developed our method of restoring British Cars over the past 30 years and 450+ successful restoration opportunities. We are one of the few shops in the industry that has developed and utilizes a production line in restoring British Cars. 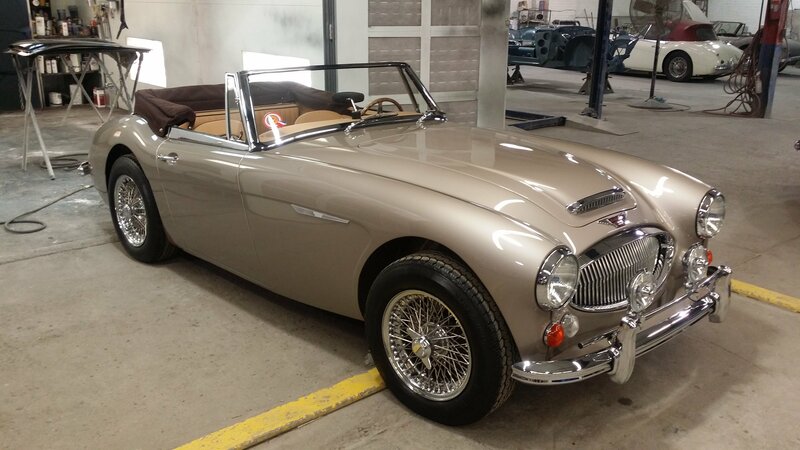 Our team of nine professional British Car restorers can provide the finest quality fit and finish in less time, and more economically than the shop that is learning the procedure on your car. Invest in precise fit and exceptional finish for your automobile. Whatever condition your car is in, we are the team to trust. British Restoration Corp. in Philadelphia, PA was founded by Knut Holzer as British Motor Corp. We have been operating for over 30 years. Under the new management of Huy Tran, we are committed to providing high-quality services that meet our customers’ expectations. Why Choose British Restoration Corp.? We Restore Back To Factory Specs. We take great pride in our work and keep our standards high above any standards. We keep to our word in terms of customer satisfaction. You can depend on us for any restoration solutions and automotive care advice you require. Visit our shop today for a personal tour. For questions or inquires, feel free to call (917) 257-3410. Copyright © British Restoration Corp., 2016. All rights reserved.